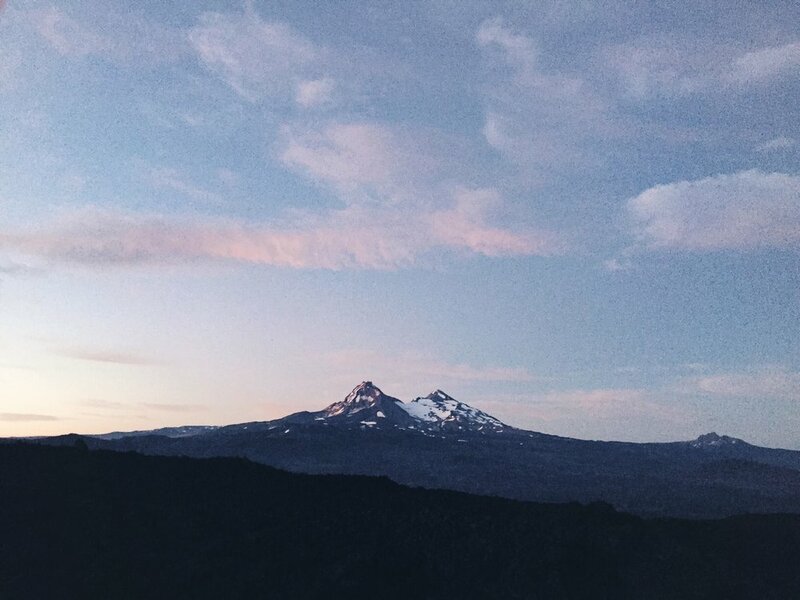 At 3a, I rolled around in my sleeping bag debating or not to get up to hike the in dark through the lava field. Lay wide awake wasting time or get up and hike in the dark by myself? I finally worked up enough motivation and started packing out by 330a. I really don't like walking in the dark alone, especially in the trees. It's so spooky. The first 20 min I kept thinking something was gonna jump out from the sides or some animal was following me. I kept trying to tell myself I used to do this all the time and everything was going to be fine. Then I started praying about my anxieties I've been having the last few days when I've camped alone. I prayed for my friends and family at home whom I miss and I prayed for the father and son I met the night before who has been carrying stuffed animals that belonged to their grandson/son that they lost earlier this year. My heart was heavy and full. Shortly after, I began seeing north and middle sisters lit by the colors in the sky. I was no longer afraid of the dark. I reached the burned trees again and passed by some campers. One of them was the father and son, always nice to see them! I walked during the sunrise and everything was literally illuminated. Mt Washington was right in front of me so clear and I could see Jefferson a little bit behind. I crossed just a little more lava field but that was it. The rest was just a climb up behind some trees on some soft dirt. I decided to bypass big lake as I had enough water and really didn't want to do any extra miles. I walked walked walked and made it to the santiam pass th at 1p! Way earlier than expected. It was around 16 miles. I was so eager to get to sisters to finally rest and get cleaned. I also hadn't pooped all day bc I ran out of magnesium. I am so sad. I had texted w Natalie and she was coming to get some at 130! I saw this other older hiker I met on trail and he was sitting at the busy hwy. I told him if he goes up ahead a bit, there will be a calmer th to wait at. I sat for a bit changing out my shoes and catching up on my phone then the whole Grummer clan shows up w Emmy! It was so good to see them. I didn't realize how dirty I was!! We got in the car and arrived at their new house in sisters. It was so cool to see their new place this time around and that I was actually hiking there. Their floors, cabinets, ceilings, light fixtures, everything was SO nice and well put together! Felt so spacious and not claustrophobic. We last year, we were looking at tile and carpet samples when we helped picked some of the things out. I finally got around to showering and it was the best feeling ever. It's a bit hard to scrub all the dirt off. I lost a ton of hair in the tangles as well. Yikes. It took forever brushing it out. I need a new hair style that doesn't tangle but it's hard to make one that's off my neck. so dirty. Four miles to civilization. I walked out of the shower a brand new person and was now able to sit on furniture without leaving dirt marks. It's crazy how much a shower can do for your morale. I then threw in a load of laundry. I couldn't wait. We sat around the nice house w ac and chilled while the girls played outside for a bit. It was windy but hot outside. It feels amazing to be in a temp controlled home. We also met some of their new neighbors next door who were just moving into their weekend home. Then it was dinner time. Natalie made us green beans and red sauce/goat cheese penne pasta. I LOVE pasta. Forever. having new shoes early is a great feeling! After dins, I helped the girls clean up except they actually did most of the work and I was getting super tired around nine. I worked up some strength to finally get a blog up before passing out. Pia gave me her bed and I'm sleeping in their room w Tallis while she's on the couch. I can't wait to sleep in a bed tonight.